From the moment you walk into Barre Fusion Pilates your mood is transformed. Between the friendly staff (Jennifer, the office manager, is always there to greet you with a smile!) and beautifully appointed studio, you cannot help but start to feel relaxed. So what is pilates and how could it benefit you? That’s exactly what i’m going to share with you. 🙂 I will also explain how during the month that I added pilates to my fitness regime, in only one month, I had so many positive results in my overall fitness, health, and appearance that definitely were a result from the classes here. Pilates is a physical fitness system that was developed in the early 20th century by Joseph Pilates. It was designed by him during the First World War to improve the rehabilitation program for casualties. Pilates helped injured soldiers regain their health by strengthening and stretching key muscles. Joseph believed that mental and physical health were essential to one another, creating what is a method of total body conditioning. Pilates uses correct alignment, centering, concentration, control, precision, breathing, and flowing movement to establish a perfect working body from the inside out. Pilates emphasizes your body’s core: the abdomen, obliques, lower back, inner and outer thigh, and glutes. 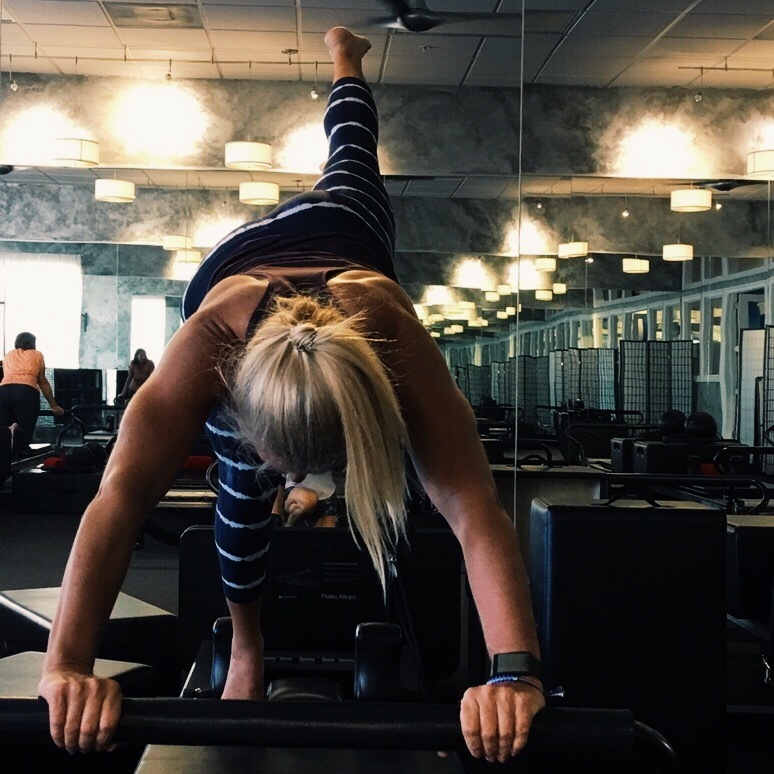 For this reason, Pilates develops a lot of what exercisers/athletes need, which is strength, flexibility, muscular endurance, coordination, balance, and good posture. It’s because of its core focus, Pilates is popular not only in the field of fitness, but also in rehabilitation. There are two different kinds of pilates: mat and reformer. I did the reformer classes at Barre Fusion. It’s essentially a machine which has a sliding platform with a stationary foot bar, springs, and pulleys that provide resistance to help tone the body. It’s a little intimidating at first, but the instructors will help you in choosing the right resistance and getting into the proper positions to ensure you are doing the movements correctly. (and so you don’t catapult yourself off the reformer! lol) Pilates is about more precise movements requiring control and technique over increased repetition. The instructors are all very knowledgeable and, like I mentioned, great about making tactile adjustments to ensure you’re in proper alignment while doing the movements. Each one (Lisa, who is also also the owner, Gina, and Cathy) has their own unique style since they all have different backgrounds from yoga, running, tennis, and ballet, but it’s clear they all share a love for Pilates and the positive effects it can have on the body. Most of the work is on the reformer, however a smaller class may use the “chairs’ or tower reformers. Some classes may even have some cardio when they use the jump board! It converts a reformer into a horizontal jumping machine for plyometric and aerobic exercise. It’s an excellent, non-weight bearing method to increase heart rate. (of course I LOVED this!) They make classes fun and with so many exercise variations and progressions, you may have a hard time getting bored. Barre Fusion also offers privates as well as Pilates for golf. Through stretching and these controlled movements these classes build lean muscle tone and rather than bulking and shortening the muscles, it emphasizes lengthening the body and aligning the spine. I can honestly say first hand, this has been a truly amazing compliment to my CrossFit workouts. In just one month I got leaner in my appearance and felt better, more relaxed. Not sure if it’s coincidence, but during the month I also got my best 1 mile run time ever and a power clean PR! I am the first to admit, I know I don’t do enough stretching so this was a perfect balance for me and I feel like it was such a benefit that I’m going to continue to incorporate it into my training! Joseph Pilates said, “In 10 sessions, you’ll feel the difference, in 20 you’ll see the difference, and in 30 you’ll have a new body”.